RANGOON — Rangoon police have warned the public to be on the lookout for suspicious packages in public places as a bombing in Pegu Division reportedly killed two and a series of bombs have been placed in Burma’s commercial capital in the space of a few days. Three small bombs have exploded since Friday, a mine was discovered Monday at a Chinese restaurant in Rangoon and a bomb was found at an eatery in Mandalay, also on Monday. On Friday, a bomb blast at a guesthouse in Taungoo Township, Pegu Division, killed two people and injured one at about 9 pm, according to local media reports. According to the Democratic Voice of Burma, a man and a woman were killed and another woman was hospitalized when the bomb went off in Taungoo, a town about 220 km (137 miles) from Rangoon. Then in the early hours of Sunday morning, a bomb exploded at a bus stop in northern Rangoon’s Insein Township. The blast damaged a bus stop and a billboard but no one was injured, according to the government-run New Light of Myanmar newspaper. 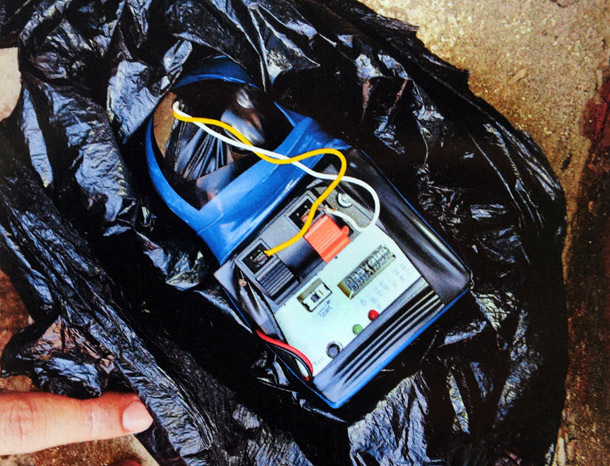 “According to reports, police also discovered a home-made bomb with a C-4 detonator, a clock wires at a garbage near the scene [sic],” the newspaper reported, adding that the case was being investigated. Also Sunday, another homemade bomb attached to the underside of a truck exploded at about 5 pm in Rangoon’s Thaketa Township when two youths tried to remove a clock attached to the device, according to a statement posted on the Burma police force’s Facebook page. The two youths were only slightly injured in the blast, the statement said, naming them as Htet Naing Aung, 14, Win Min Htwe, 14. On Monday, police in Ahlone Township said a small mine was found fixed under a table at Western Park 2, an expensive Chinese restaurant in western Rangoon. In a press conference Monday afternoon, Win Naing, a police officer in Ahlone Township, said the mine, which was discovered by staff cleaning the restaurant on Monday morning, had been removed safely without being triggered. “We do not think they wanted to harm the people. They could have harm the people or me if they wanted while we were defusing it,” he said. Another bomb was found at central Mandalay’s Bal Lay Burmese restaurant at about 1:30 pm on Monday. Police removed the bomb and detonated it in a controlled explosion outside of the restaurant. The police statement, posted on Facebook on Sunday, told the public to be vigilant after the series of incidents involving explosive devices. “We inform the public that if they find a strange package at bus or train station, or a seaport, please do not open it and please inform a nearby police station or township authority or official headquarters as soon as possible,” it said. San Min, a township official in Thaketa told The Irrawaddy on Monday that an investigation was underway to find out who was behind the bombings. “We will tell the public when we are ready,” he said, adding that authorities were also trying to establish whether the separate incidents were connected. Small bomb blasts occurred frequently under Burma’s military regime, and were normally blamed on armed ethnic groups, although many believed the authorities were behind the explosions. Such incidents have become rarer in recent years, and security at borders has been heightened this year in anticipation of December’s Southeast Asian Games. Win Khaung, the national police chief, said in August that official intelligence had identified a terrorist movement the country and that heightened security was needed to protect increasing numbers of foreign visitors to Burma.